"Ultimately the brand resides in the minds of its stakeholders," branding guru Kevin Lane Keller once wrote. Yet, in today's 'cluttered' world, it is difficult to occupy any place in customers' minds, let alone a differentiated and superior position. The challenge for B2B and B2C marketers is to develop and execute a unique, ownable, and consistent brand strategy that will take hold and endure. In this free webcast, Jeff Maloy, Senior Vice President of Copernicus Marketing Consulting, will describe how you can ensure your brand strategy will reach your target customers and be reinforced in their hearts and minds. He will present a framework for aligning the 7 critical components of a brand strategy, as well as offer a process for translating this strategy into execution. - The framework and key components of a compelling, cohesive, and powerful brand strategy. - How to successfully manage the transition from development to implementation. - Criteria to evaluate different executional elements - from logos, to new products, to ad campaigns. Michael Brenner - Best-selling author of "The Content Formula"
Having great ideas is one thing. Having an organization designed to embrace great ideas is a completely different thing. In this webinar you will learn a new framework for creating the culture you need within your team to allow great things to happen. You're a leader. Whether you work independently, lead a small team, or you're the CMO of a global brand - you know that yesterday's marketing ideas just don't work today. Unfortunately, getting the entire organization to embrace your new initiative, green light an innovative marketing concept, or simply redesign your newsletter can feel like an uphill battle. In this webinar, veteran marketer and bestselling author Michael Brenner will show you how courageous marketing leaders are transforming their entire culture, and building a powerful brand. You will learn the revolutionary new framework that sparks rapid culture change and gets your entire organization on board. EVERYONE has the power to spark culture change and become the leader your company, your brand, and your people need. Join us and find out how. A Marketing Resource Management (MRM) system allows organizations to easily maintain brand consistency of collateral across channels and teams. By centralizing brand-right content in a powerful technology solution, team members can quickly login, find what they need, customize it as necessary, and be assured that it is on point with their brand messaging. - Discover why an MRM system is a great investment. - Learn unique applications and considerations for your own MRM. - See examples of best practices. - Discover how other departments outside of marketing can also take advantage of the technology. Real customer examples will provide an eye-opening look into ideas that will inspire and empower you to either examine the need for implementation of an MRM system, or make the most of the MRM system you already have. We hope we get to (virtually) see you on November 15th! Reserve your free spot today. If you struggle with how to maintain control of your brand while ALSO giving your marketing teams and sales agents the flexibility to create their own materials – you are not going to want to miss this free webinar. During this session, we will explore how your organization can best utilize a Marketing Resource Management (MRM) system to streamline processes and empower decentralized teams to create brand-right marketing materials on the fly – thereby creating team efficiency AND ensuring a cohesive brand experience is delivered every time. - What an MRM system is and how it supports a variety of marketing distribution models. - The key benefits of an MRM system to the brand’s stakeholders. - How to select the right MRM system for your organization’s needs. - How to implement your new system and encourage adoption. Today's consumers take full advantage of their ability to share their perceptions of, experiences with, and feelings toward a brand – whether brand-driven (e.g., CSAT surveys or brand perception studies) or consumer-generated (e.g., social commentary or product reviews). Yet many marketers aren’t making the most of all of this valuable information flowing into their dashboards, CRMs, and survey platforms. The energy seems to be placed on the capturing of the data rather than its utilization. You are likely already sitting on a gold mine of insights. The question is - how can you transform the customer feedback you already have into the actionable intelligence your brand(s) need to succeed? The 2015 Brand ManageCamp marketing conference was held on Oct 1-2 at The Mirage in Las Vegas. Over 400 senior level brand marketing professionals were in attendance for 2 days of actionable insights, tools, and techniques to build, grow, and manage more profitable and more successful brands. Hear what some of the speakers and attendees had to say about the experience! John Hall, co-founder and CEO of Influence & Co.
With all the data that’s out there on content marketing, it’s easy to start following someone else’s lead because "everyone's doing it". But what most companies forget is that you must take a closer look at how these strategies apply to what you’re trying to accomplish before jumping right in. Don't just follow the crowd -- find a unique twist and use it to fuel your marketing efforts. In this webinar, John Hall will discuss why using your expertise can differentiate your company and take your content strategy to the next level. Additionally, why a content strategy is an opportunity to dive deep into your long-term goals, focus on the “why” behind your brand, stay top of mind, and build trust with your audience to create new opportunities for your business. He will offer unique and exclusive insights on how to organize your company's knowledge and start publishing expert content on platforms that make sense for your brand. Through this process, you can accomplish the above goals and start positioning your company as a true industry leader. We all know that Net Promoter Score is a useful tool to track consumer advocacy over time. But did you know that studies have proven that increases in NPS correlate directly to significant growth in revenue and market share? In fact, there is even a stronger correlation between reducing detractors and increasing revenue. Given that, I am sure you will agree that it is absolutely crucial for us to understand and optimize customer experiences in order to attract and retain brand promoters while minimizing brand detractors. But, even with all of the data available to marketers, it is challenging to determine how to efficiently and effectively improve experiences and nurture advocates. As it turns out, the scores are important - but the context behind them is what is critical to success. 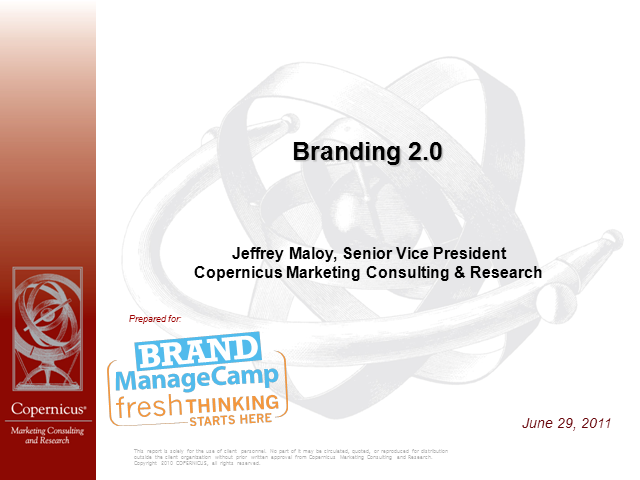 That is we are so excited to announce the next iteration of the Brand ManageCamp Webinar Series ( http://brandmanagecamp.com/webcasts/ ). Please join us at 1pm EST on Wednesday, February 11th as Adriana Smith of Reliant Energy and Lisa Wall of iModerate detail how Reliant Energy gained important context behind their Net Promoter Score using a new, innovative solution - (iM)merge Analytics. During this free webinar, you will learn how this deeper understanding has enabled Reliant to align a team towards an internal goal, stem detraction and increase loyalty in their customer base, and stay ahead of emerging trends. You will also gain insight into how you can make sense of consumer commentary, ranging from survey verbatim to social to product reviews and much more. Hours of creative brainstorming are no match for even one misuse of your brand messaging. Rogue marketing is the bane of every marketer’s existence, and it happens more often than you may know. When sales reps, regional offices, franchisees and channels can’t find the marcom they need, they don’t get mad – they get creative. The result is your pristine branding receding into a Frankenstein-esque rendition that’s a far cry from anything resembling the perfected asset you originally released in confidence. Sean Sullivan & Jim Van Natter of MarcomCentral have seen it happen in large and small companies alike across a huge spectrum of companies. They have examples to prove it. Sean/Jim will not only share examples of rogue marketing, but also the simple marketing asset management tools and tactics companies have successfully used to beat it. As a marketer, it can be challenging to see past the daily task list, get out of reactive mode, and talk to consumers in a meaningful way. The ability to truly be proactive, identify trends and opportunities, understand KPI movement, and keep the competition in the rear-view mirror is the goal, but getting there with today’s research approaches is a challenge. Relying solely on Big Data or focus groups doesn’t make you smarter and won’t put you ahead of the curve. So how do you avoid ahead being on the wrong end of the Greek Yogurt phenomenon? How do you see consumers’ embracing the shared economy before it’s a widespread trend? In this free webinar we will introduce you to the world of QualTrackers, a new solution that combines structured, ongoing, consumer conversations and advanced text analytics to spark consumer intimacy, provide a crucial ongoing narrative around key business issues, and deliver the metrics you need to aid decision making. Using consumer confidence as an example, attendees will see how this innovation does much more than just plug holes and fill gaps – it gets your ear to the ground and reveals what’s next. Corporate social responsibility is now table stakes -- the universal consumer expectation for companies to be responsible is immense and undeniable. In a world where nearly every company supports a cause, it’s not just about associating with a social or environmental issue. It’s now up to companies to show how these efforts drive real and tangible change, helping consumers understand how their dollars and time can make a difference. The 2013 Cone Communications/Echo Global CSR Study reveals that around the world, varying degrees of perceived individual and corporate impact underscore the overwhelming need for companies to consistently communicate both corporate and consumer CSR return. Join Cone Communications executive vice president Alison DaSilva and chief reputation officer Mike Lawrence in a free webinar discussion about how leading companies can design successful CSR strategies that not only make measurable business, brand and societal impacts, but help take collective responsibility to a whole new level. Recently there has been an explosion of technologies available to us to help manage our brands. Everything from Marketing Automation to CRM to Social Media Management, to SEO, to Analytics, to Digital Asset Management, and more. It can all be a bit overwhelming. Thankfully, Dustin Ritter is here to help. In this free webcast, Dustin will teach us about all the different categories of technologies that are available, give us some insight as to who the main players are, and prepare us with the knowledge we need to start narrowing down and figuring out which ones are for us. In the popular imagination, innovation is about brilliant people with brilliant ideas, doggedly pursuing their dream and breaking through every obstacle that stands in their way. The reality, however, is that innovation is fundamentally a team sport. Sure, one person can come up with an idea, but an idea is only a beginning. After a commitment to a great idea, the full nature of the innovation challenge becomes clear. Somehow, companies have to tackle two conflicting tasks simultaneously: building something new and sustaining excellence in what already exists. This requires more than just general, feel-good teamwork. It requires a team that is structured in a very particular way. Unfortunately, most companies aren’t familiar with what these teams look like. Like a newcomer to the baseball playing world, they have little idea, if any, about the roles on the team. They have no idea what the pitcher, catcher, infielders, and outfielders do. In this webcast, Chris Trimble will outline exactly how to build the right team for every innovation initiative. He will also talk about how his new book, How Stella Saved the Farm, can be used as an instigator of productive conversations about what it really takes to make innovation happen. Join us at the free webinar as we bust the biggest myths of consumer insights! A recent Harvard Business Review report showed that only 11% of Fortune 1000 Marketers are using customer insights to make business decisions. Why? Because research is perceived to take too long and cost too much (MYTH!). In this free webinar, GutCheck CEO Matt Warta bust this myth and demonstrate how winning brands are adopting a more agile approach to research and moving faster than the competition by leveraging the power of on-demand communities. He will showcase how today's brand innovators can get robust feedback from a group of their target audience in just a few hours (instead of weeks) and help guide same day business decisions about advertising campaigns, product concepts, and much more. If you are under pressure to demonstrate what your customers are thinking but are constrained by time and dollars, you won't want to miss this free webinar! Today’s marketing is all about creating one-on-one conversations with your customers. In this webinar, you’ll learn how to create precisely targeted dialogues with your customers across all of your channels – from direct mail and print ads to your web and social media pages – using technologies like digital printing, augmented reality and QR codes. Hear how various organizations created transformational cross-media campaigns by learning to customize content, images and offers and finding new ways to engage with customers --strengthening brand loyalty and increasing response rates by 20 percent or higher. Marketers have always loved Brand Advocates because they help to build awareness, positive perceptions and trial of brands. In recent years, Brand Advocates have taken on even greater importance to marketers. In general, consumers have grown more skeptical of advertising and have placed greater emphasis on recommendations of their friends, family and other consumers. At the same time, the proliferation of digital technologies has given Brand Advocates the tools to quickly and effectively reach networks of their friends and other consumers. Social networks, blogs, video-sharing, review sites and other digital tools make it much easier and more effective for Brand Advocates to advocate for their favorite brands than even a few years ago. In this webcast, Eric will define Brand Advocacy, discuss the rate of Brand Advocacy across brands and categories, and provide ways to identify Brand Advocates and their worth to marketers of different brands. He will also explain how and what to communicate to this group to nurture their advocacy. Marketers have been discussing the importance of personalized content for decades. Over the past few years personalization has become fully obtainable and easy to implement thanks to the emergence of technology solutions, consumer data, and digital media vehicles. This webinar will review the variety of ways you can personalize your marketing and how to maximize message relevancy to both prospects and current customers. It’s no secret that in many categories brand loyalty is declining faster than the price of Facebook’s stock. Kevin Clancy believes poor targeting and lack of a consistent, compelling positioning are a major reason so many company’s struggle with connecting customers to their brand. In this webcast, Kevin will outline a process that considers profit-related criteria such as retention potential, level of satisfaction with current brand, likelihood to try or usage of a competitor’s brand, and problem potential when assessing the value of current and prospective customers. He will also explain the relationship between the magnitude of the problem a brand solves of a customer and market response in the form of sales and advocacy. Tune into this free webcast to learn how personalization of marketing projects and campaigns produces higher response and conversion rates and, in return, top-line growth. But it is not enough to just personalize and move on - we need to understand how to track accurate results. As such, we will explore the newest digital tools and processes that make it easier for marketers to tier and segment customers properly, provide personalized content, and measure performance. Learn how you can use these tools to improve customer loyalty and acquisition and achieve measurable profit growth for your organization. Kevin Clancy, author of "Your Gut Is Still Not Smarter Than Your Head" and "Counterintuitive Marketing"
With all eyes on marketing's ROI, it is not enough for marketers to just understand what they get for what they spend. They must also determine what to do in order to continuously improve their rate of return. In this FREE webcast, best-selling author and renowned thought-leader Kevin Clancy will present the latest statistics on the ROI of many different kinds of advertising - from traditional to search. He will compare and contrast current returns yielded vs. those in the past; look at the results of different industries and categories; and address the difference in returns between offline and online media. Based on the trends in the data, Kevin will offer up what he sees as the 3 biggest opportunities for B2C and B2B marketers to improve the future performance of their advertising programs and he will demonstrate what approaches you must rethink in order to fully tap into these opportunities, as well as what to do in order to ensure transformational ROI. As Marketers, we all understand the importance of maintaining control of our brands. However, as our organizations become more decentralized and autonomous, we have also learned the value of allowing our various constituents (field marketers, sales people, brokers, agents, franchisees, vendors, suppliers) the flexibility to customize print and digital marketing materials on-demand. Such customization allows our organizations to provide optimally relevant messaging to our end-customers – maximizing ROI and minimizing inventory waste. The big question that looms, however, is how do we allow customization without ceding all control of our brands or creating unwieldy and complicated approval processes? Luckily, over the past several years, there have been enormous advances in technology that can help us release the reigns and allow on-demand customization of marketing materials while ensuring our marketing assets and messages (such as logos, taglines, boilerplates, presentations, etc…) are used accurately in both print AND digital marketing by providing streamlined, automated approval processes. In this FREE webcast, Dustin Ritter, Vice President of PTI Marketing Technologies, will show us how companies both local and global have embraced technology to automate brand control processes while enabling the customization of selected content and visuals in their marketing pieces. You will walk away from this session with a comprehensive understanding of how your organization can more efficiently incorporate a multi-channel strategy in your marketing mix while ensuring full control over customized print and digital marketing materials. There are far too many brilliant branding folks out there for us to be able to include them all in the annual Brand ManageCamp conference. That's where the webinars come in! Extend your learning experience and gain access to some of the best and brightest in brand today!